My (real) job is killing me, so I couldn't work in the game in the last two weeks, but I'll come back to finish the demo to share with you. Like is Crazy! Was Nattevandrer's Sasha Banks pic the inspiration? Some great stuff on his page. Oh man, that pic has always been a nigh perfect example. Cornelia is one of my all-time favs. Huge, thick, roided. I fantasize about getting extra massive with her. I always wished she would grow a beard. Close to my ideal FBB. So thick and roided. Fantastic.i look forward to end result. 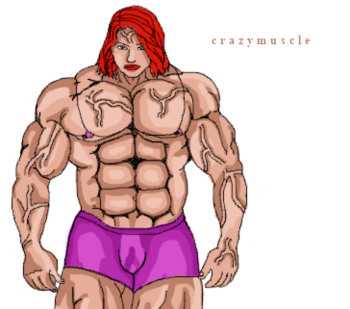 I know there's been some talk in here about female to male transitions but anyone else like male to female trans with muscle?